HiPace turbopumps installed at XFEL. The European X-Ray Free-Electron Laser (European XFEL) is a research facility that generates ultrashort X-ray flashes: 27,000 times per second and with a brilliance that is a billion times higher than that of the best conventional X-ray radiation sources. The flashes are produced in underground tunnels and will allow scientists to map atomic details of viruses, film chemical reactions, and study the processes in the interior of planets. The processes at European XFEL require ultra-high (UHV) or high vacuum (HV) conditions. 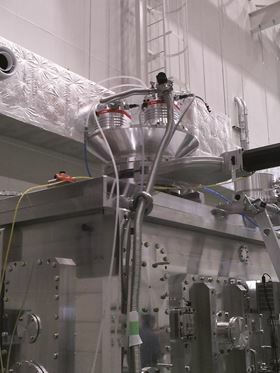 It is important to maintain a good level of vacuum so that the XFEL beam and high power lasers can propagate and interact with matter at the experiment stations without being affected by air molecules or hydrocarbons generating background signals on the detectors. Pfeiffer Vacuum, in cooperation with European XFEL, developed solutions ranging from vacuum pumps to leak detectors to vacuum components for many vacuum applications at European XFEL.